There's a definite tang of autumn in the air, and for a change the leaves are turning colour before December! There'd been some rain over the weekend but I hadn't been able to get to the river owing to catching up with business following the PAC Convention. 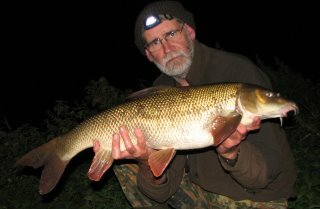 By the time I was able to get out the river had dropped a bit, and with the full moon I wasn't too confident. At least there was cloud cover which would keep the air temperature up after dark. There were also a few showers around, but nothing major. Even so it's time for a slight change of tactics. The session started badly when my fifteen minute hike to my chosen area revealed that part of my low chair was missing. With nobody else on the stretch I left my tackle in the swim and retraced my steps - all the way back to the car where there was also no sign of the missing backrest. I eventually set up around five pm, and was planning to move at eight. Two minutes past eight the downstream rod jerked and the reel handle spun backwards. Some idiot had left the anti-reverse off! 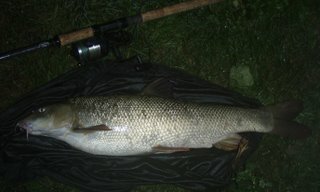 It was a barbel, but not a monster despite the change of tactics. As the water temperature starts to fall in autumn I ease up on the freebies and add attractiveness to my hookbaits in the form of paste. The idea is to draw fish to the bait without feeding them too much. 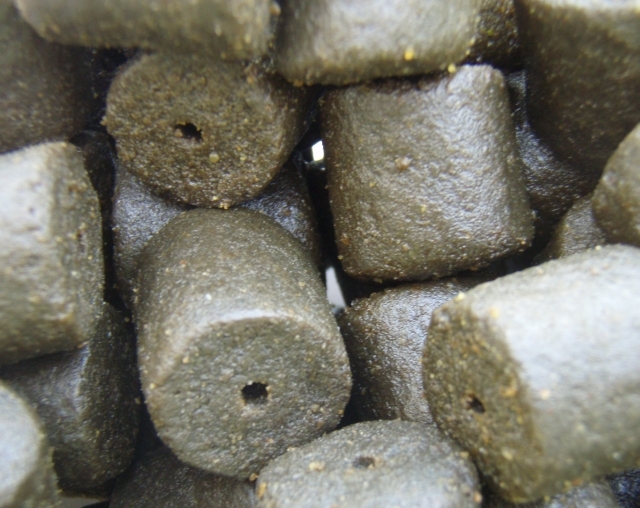 One way is to use the boilie sausage - two boilies on the hair with a 'doughnut' of paste wrapped around the hair between the boilies as per the photo. Around eleven the cloud cover thinned and the moon shone with all it's brightness. Time to go home. Continuing my exploration of the Trent's upper reaches I started off on Thursday afternoon on a bend I hadn't seen before. There were plenty of potential fish holding features, nice changes in pace and small fish topping. Water level was down to summer level and running clear. Nonetheless, with a couple of hours of daylight left I decided that the deep water wasn't for me, to mark the area down for future reference, particularly flood water conditions, and move. Half an hour later I was settling into the burdock peg. At least I felt the snag would offer me a chance of a fish. It wasn't until after dark that the opportunity came. At ten thirty the rod whacked round and something was kiting straight out into the flow after a brief attempt at getting under the tree. A nice eight pounder to start off with. Fishing on until after midnight I had no further action but resolved to be up and at 'em in the same swim at first light. Sure enough I was, but the hoped for early action didn't happen. As the day got brighter my hopes started to fade when just after eight the rod slammed round and I was holding on while the fish made for the tree. Standing on the bank about six feet above the water level, with nettles and willows either side the rod was being pounded into the undergrowth. There's no option in this swim but to cling on until the rod tires the fish and forces it to head out and upstream. Then it happened, I felt a bit of a grating sensation and all went slack. The line hadn't parted, the hook had come free. This is the second time I've had that happen in this swim. 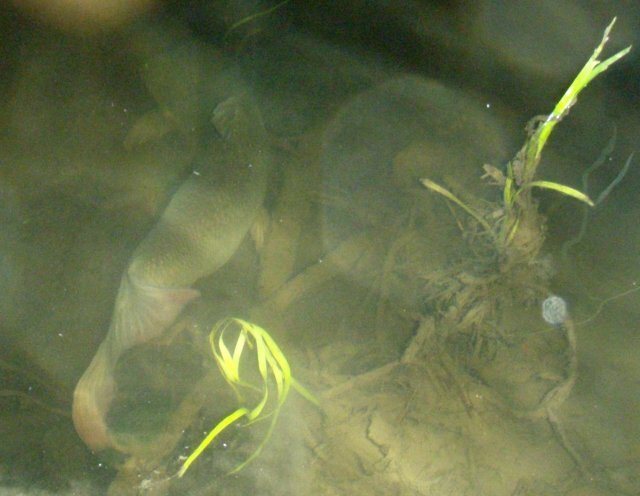 I have a feeling that the brief contact of the line or lead with whatever it is down there is enough to somehow allow the fish to slip the hook. I apply just as much pressure to all the fish I hook, but only seem to suffer 'hook pulls' when there is some contact made with the line by an inanimate object. By eleven I was getting the urge to move, so wound my rod in and went for a wander downstream. A swim had been opened up under some trees that looked promising, so I moved my gear into it. 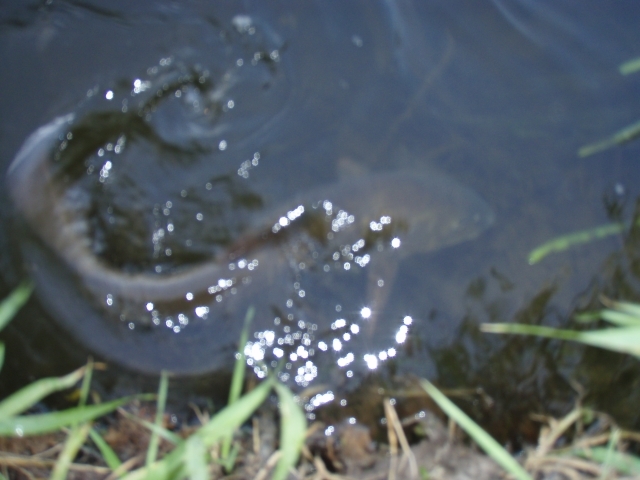 Deep water, maybe seven feet, close in with a gravel bed, shelving up towards the inside of the bend on the far bank. Trailing branches either side, and a shallow run downstream added to the attraction. 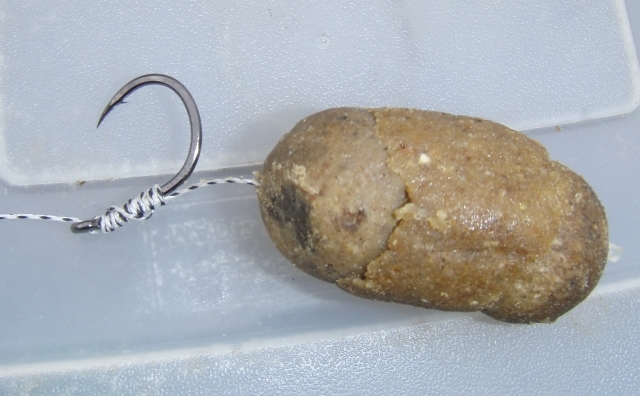 Some small fish were topping so I decided to save a blank by putting out a maggot feeder. First chuck in and a chublet was caught, followed by three more before I decided I wasn't happy. It's another swim with potential for future sessions, though. Part of the reason for my unhappiness was a near spectacles catastrophe. There had been some rain in the air so I'd erected my little roving brolly. Under the trees the main force of the strong wind was absorbed by the branches, so it had remained stable. I was having a look through my binoculars, which involves removing my specs, at an unusual landscape feature when a gust of wind flipped the brolly into the brambles and nettles behind me. This wouldn't normally cause me any concern. Except I'd put my glasses down on top of the umbrella. So there I was myopically struggling to locate the errant glasses in the undergrowth with a sense of mild panic setting in. I was just considering going back for the old pair that I always have in my car when my heart soared as I made out the blurred vision of my glasses under some nettle leaves. What a relief! I was intending to go back to the burdock swim, but someone had dropped in and had caught a smallish barbel in the couple of hours I'd been away. Not to worry, plan B was the one I really wanted to put into operation anyway. Within an hour I was a couple of miles downstream with two baits out in the swim I'd had four barbel from last week. With the level down I could see how shallow it was here and as the swim entails fishing close in I knew I would be waiting for darkness to have a chance of a barbel. 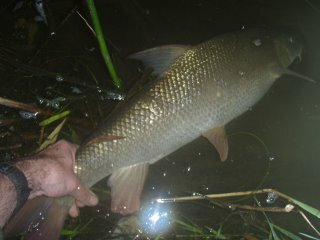 Even so, during daylight a couple of chub hooked themselves which gave me some hope that the barbel would be along later. 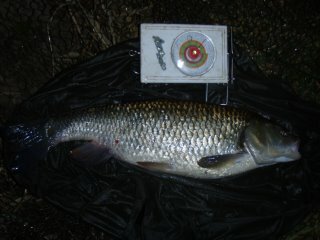 Having only had four hours sleep I didn't intend fishing until too late, half ten would be my cut off point. To be honest the strong wind had been sapping my enthusiasm all day, and by ten I had had enough. The wind wasn't a problem from a technical point of view, and with my bunny suit on I was comfortable enough, but there's something about a continual strong wind that seems to drain my energy and enthusiasm. Anyway, I'd got my rucksack packed, emptied the maggot box and the remains of my hemp/groats mix, and taken off the bunny suit when the downstream rod did its see-saw imitation on the rod rest with the Baitrunner grudgingly giving line. There was a dead weight on the line when I bent into the fish and I wasn't sure if it had picked up some debris from the weed and flotsam raft I had positioned the bait near. As I pumped the weight upstream it headed out into the flow, then I drew it towards the slack water in front of me almost convinced it was another c*rp. 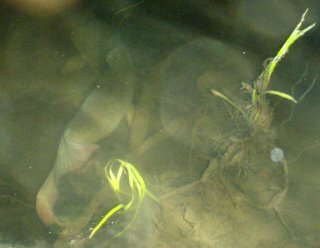 It then powered back out again and turned upstream just below the surface with its dorsal cutting through the water in the light from my head torch. A barbel, no mistake, and what a scrapper! In such shallow water, less than three feet I'd say, when a fish decides to go it has to go away from you, which always makes the fight feel more spectacular. 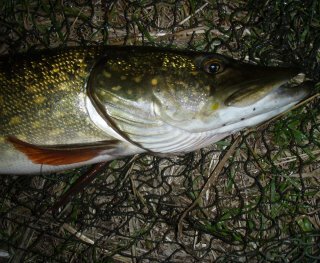 When I eventually I got it in the net it looked a short but solid fish. Definitely one to weigh. I thought it might have made eleven, but I'm not to a few ounces. At the start of the season one of my aims was to catch an August double, and with less than three hours of the month left I'd caught my second. I headed for home a happy man eager to return for more.